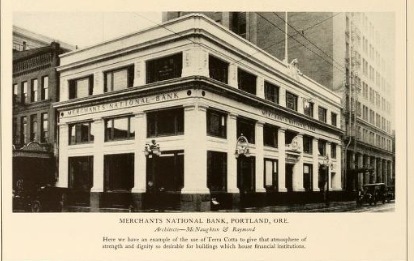 Poking through the files I found this image [top] for the Merchant’s National Bank in Portland Oregon built in 1912 to the designs of architects McNaughton & Raymond and was struck by the similarity to the Edgett Building at Pender and Cambie built in 1910 to the designs of A.A. Cox. Fate has been kinder to the Vancouver structure. 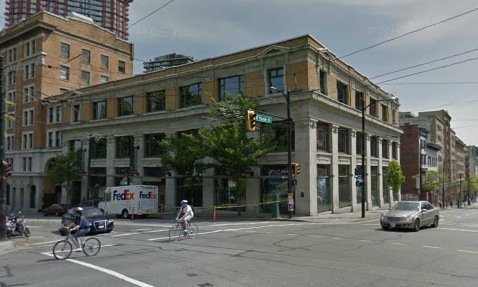 It was restored as the offices of the Architectural Institute of BC in 2003. 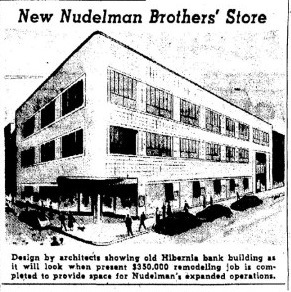 The Portland building ended up being renovated in 1947 as the Nudelman Brothers clothing store with “ceramic veneer terra cotta with aluminum trim” Check out Vintage Portland, a great blog on that city’s history.